It is our fear that the motion before Council would tie the hands of city staff and the LRT Project Team by preventing them from designing into the project the very best practices that are essential to the success of LRT. Any visitor to Hamilton will tell you that our main streets (particularly Main Street) do our city no favour in leaving a positive impression. They are repellent rather than inviting. And that's bad for business. Contrary to the countless experts who have advised us over recent years that enhancements to our built environment will lead to increased livability, we have done very little to take advantage of the best economic development opportunity before us in the 21st century: intensification of and tourism to our lower city. Yet, just as increasing numbers of Hamiltonians are finally waking to the realization that we are being limited by our 1950s-era road network and just as citizen groups are gaining strength in demanding changes, Hamilton City Council is set to discuss a motion to impose a "Moratorium on Any New Projects, Roadway Alterations or Designs That Reduce Motor Vehicular Capacity on any Roadway within the LRT Corridor". The motion springs from the very same mindset that for the last six decades has entrenched efficient vehicular throughput as the only measure of success of our street networks. The motion may as well propose a moratorium on progress, science and economic development. As an organization, the Hamilton Chamber of Commerce has been working hard with other anchor institutions to highlight the business case that links balanced, complete streets (streets that are designed for people, not just automobiles) implementations with the renewal of our commercial districts and neighborhoods. For Hamilton to truly live up to its potential, many changes to our streets are needed. Some are hard and expensive, some are easy and inexpensive. What makes LRT so exciting is that it is the impetus to finally, completely overhaul the entirety of the city's transportation network in one coordinated effort. The City's own "Rapid Ready" Light Rail Transit Plan [PDF] provides a roadmap for successful implementation of the Hamilton LRT project to the benefit of all users: residents, pedestrians, cyclists, transit users, drivers, goods movers, and bricks and mortar businesses. Creating an Accessible Transportation System: Transit and the transportation system will be fully accessible. 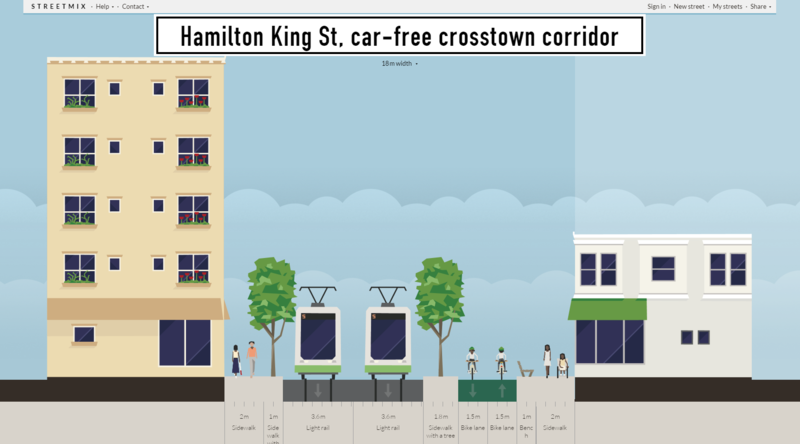 Rapid Ready makes clear that the Hamilton LRT project is a complete streets project. This conclusion is established by mountains of research that shows that transit-oriented demand - i.e. the density and ridership necessary to make the system sustainable - is interlinked with the transit user's experience in the first and last mile of one's destination (when one usually walks, or in a city with a healthy bike share system like our SoBi, cycles). It is our fear that the motion before Council would tie the hands of city staff and the LRT Project Team over the next 18-24 months by preventing them from designing into the project, and through all its impacted corridors (pretty much the entire city), the very best practices that are essential to the success of LRT. Members of the community and the businesses serving them increasingly understand the need for a rebalancing of our public spaces and streets. Our members understand that we will be competing with communities across Ontario and the world to demonstrate to investors, migrants and tourists that Hamilton is an evolving, progressive and livable city. Our success will be determined by whether we get this LRT project right. The motion before Council limits our ability to do so. This article was first published in the Hamilton Spectator . Keanin is the President and CEO of the Hamilton Chamber of Commerce. This is very true, but often very, very, very expensive to Complete Street a 1-way street (e.g. widening sidewalks, adding protected cycle track). An Amsterdamized 1-way Main Complete Street is possible, but would not easily be practical in our use case of needing to divert traffic off the King corridor (and current near-term Hamilton road design mentality). Also Complete Streets is not always simple; it can also apply to a pair of parallel streets due to special considerations (e.g. the Main-King pair), e.g. wider sidewalks+cars on Main, and wider sidewalks+LRT+cycletrack(but no cars) on King. In this concept, Main-King are considered as a single Complete Street with cycle track on only one of the two, and cars on the other. This scenario is not what probably will happen at first, but it's one of the many possible scenarios for our unique Main-King situation, too. Simpler and cheaper to use new paint and signs to convert a 1-way to a 2-way street, complete with zebra crosswalks (and signalled pedestrian crossings in the long gaps between stoplights). Bumpouts can be added later. This is a much easier step-by-step progression to a Complete Street. Yes, there is safety considerations. Right now, we have to race across between the car platoons which is simple for a seasoned person, but not something I would allow kids to do, especially when riding a scooter or bike. The habit of looking only one way before crossing streets, has put kids at risk on other 2-way streets and to cars exiting parking lots in the other direction, so we need to remove this habit as well, and provide enough zebra pedestrian crossings on a 2-way Main in the long gaps between stoplights. Punduts like to claim 1-way streets are safer because of this, but more of this is because there's fewer people plus very fast moving cars. Converting a 1-way to a 2-way is a compromise. It doesn't Complete Street the street alone, by itself, but it makes it easier to gradually Complete Street cheaply, especially as cars start diverting via Barton or Burlington, or riding/LRTing/busing instead. We still have 5 defacto corridors (Burlingon, Barton, Wilson, Cannon, Main) even when eliminating most traffic lanes from King as in the LRT plan. It is the cheapest option, costing just paint and signage changes, not rebuilding the streets to widen (e.g. double or triple) sidewalks, plant trees, install barriers for bike lanes, add chicanes etc. It does not remove vehicle lanes and actually makes it easier for motorists to reach destinations. There is some evidence that two-way conversion actually improves traffic flow by shortening trips by eliminating block circling and overshoots. It doesn't usually require removing parking (and adding parking is a cheap way of providing buffers to pedestrians). Opposing two-way conversion but claiming to support complete streets is actually supporting a more expensive, more extreme option. Two-way conversion is the conservative option: make ward 1-3 streets just like almost every other street in almost every other part of the city (and most everywhere else). It is amazing that such a conservative and cautious change is portrayed as radical! Whitehead's own motion to create a bike lane on the Claremont Access would violate this moratorium. Maybe he has changed his tune on it slightly. I expect he will argue that Claremont was already designated in the Shifting Gears Cycling Master Plan as a future cycling route, so it does not violate his proposed moratorium on new projects that "Reduce Motor Vehicular Capacity". That would be a dangerous argument for him because it means that anything that has been discussed before is, by definition, not new, thus two way conversions and bike routes can proceed. Let's be honest: with the glacial pace of change to Hamilton's streets over the past decade and a half since the Downtown Transportation Master Plan was originally approved, all Whitehead has to do is sit back and do nothing and his moratorium will, in all likelihood, still take effect in practice if not in policy. Good article in TheSpec. Thank you, Keenan. Excellent article highlighting why complete street redesigns are not a "distraction" or "complication" to implementing LRT ... they are an essential part of implementing LRT! Apparently Terry has just tabled his motion. He wants more time to lobby his colleagues in private. Hopefully not until 2016. The brand new Hamilton LRT advocacy information/community website will have launched by then -- it is a lot more work than we expected. I'll consult with others about possibly putting up a section about street conversions brainstorming, or create a parellel sister site umbrella for LRT-derived citybuilding. If you'd like to help out, contact@hamiltonLRT.ca .... 2016 will be an important year about making noise about streets surrounding the LRT spine and it almost certainly warrants a YesWeCannon style site, just alone, by itself, even separate of the LRT site. In the meantime, others can send letters to all councillors via the existing Hamilton Light Rail Website -- this is the earlier advocacy effort leading up to the successful funding the LRT by spring 2015. The email form will broadcast to all city councillors simultaneously. Easy.